The innovative AVANTE Motorised Height Adjustable Desk Frame has first and foremost been designed to provide comfort and health benefits. You can set up to 4 pre-set heights via the control panel, or adjust to any specific height, right up to 126cm. 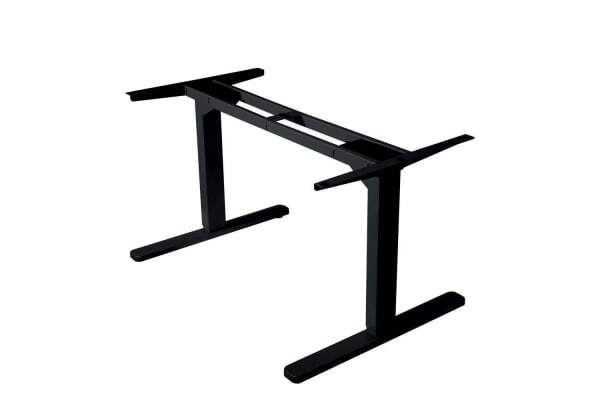 Customise with your own desktop, the frame has an adjustable width which makes it suitable for desktops between 110-190cm, and between 60-90 in depth. 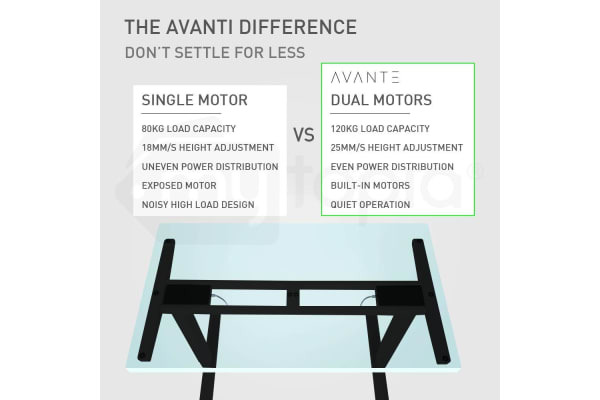 Unlike other brands, the AVANTE boasts a dual motor system. With the supplied control panel you will experience fast, smooth and quiet operation, with the added benefit of superior durability and up to 120kg capacity. Furthermore, unlike other models on the market, the motors are neatly and safely enclosed into the frame. Thanks to the ease of use and fast adjustment of the AVANTE you’ll be highly motivated to stretch more frequently, and will feel energised during the day. Keeping your muscles active will combat the health risks related to excessive sitting that often occurs while at home or in the office. The sleek AVANTE frame is a stylish modern design which will look at home in any workspace, accompanied by a quality manual for ease of assembly.